A new for boxing kicks off this Tuesday and what a month it promises to be. The first week alone gives us world title fights, Japanese title fights, OPBF title fights, world title eliminators and various other key bouts. It really does seem that after a slow start to the year the action is really getting under way in a big way. Although the month, over all, is packed with action, Tuesday isn't the best of days with just solitary small level show, but still it is an ideal way to kick off what should be a great month. 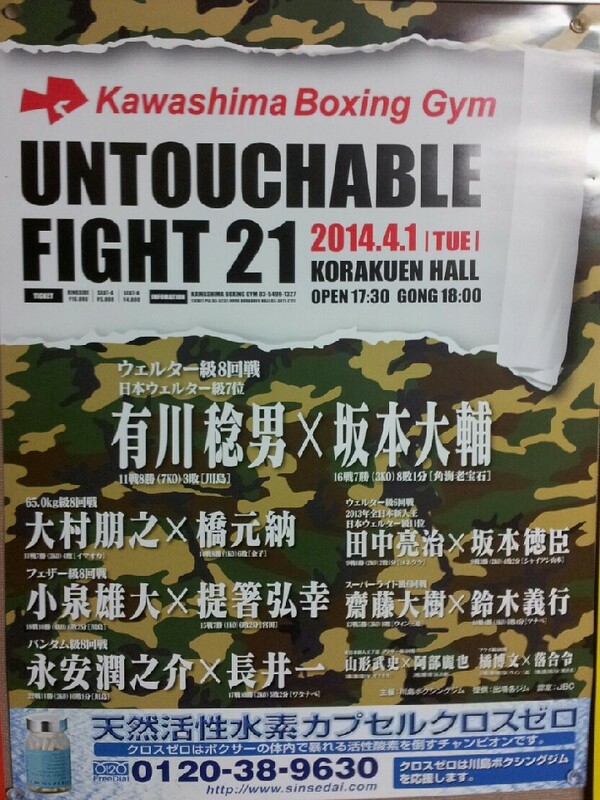 The only Asian show on Tuesday is at the Korakuen Hall, the long established holy ground of Japanese boxing. 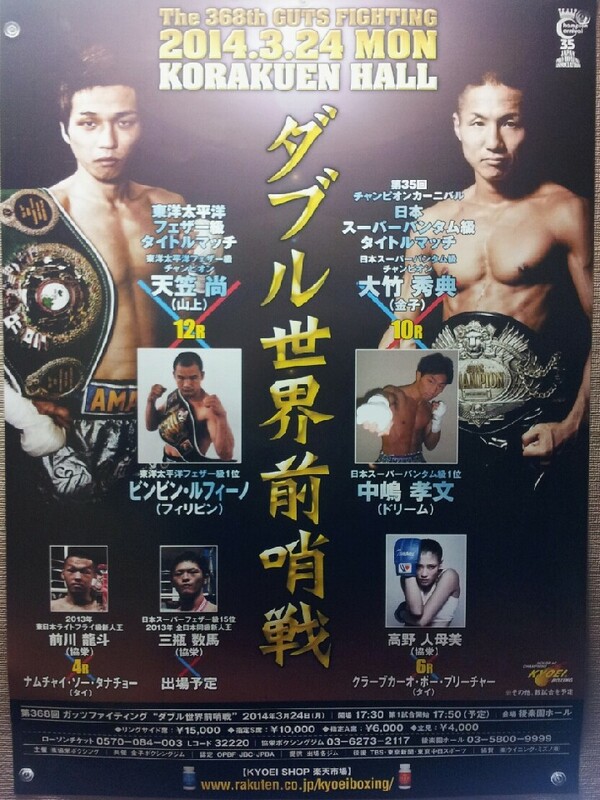 The show in question is an 8 bout card promoted by Kawashima and features a pair of Japanese ranked fighters. The first of the ranked fighters in action is Welterweight Ryoji Tanaka (6-2-1, 2) who will be hoping to record is 4th straight victory as he battles former foe Noriomi Sakamoto (3-4-2, 2). These men first met back when Tanaka was a novice and in that bout Tanaka took a 4 round decision, since then though Tanaka has gone 4-1 and scored a very notable victory over the previously unbeaten Dai Taoka in the Rookie of the year finals last year. The other Japanese ranked fighter in action is another Welterweight, this time the big punching Toshio Arikawa (8-3, 7). Arikawa, ranked in the top 10 of Japanese Welterweights, will be fighting against the win some-lose some Daisuke Sakamoto (7-8-1, 3). On paper this looks like it shouldn't be a problem for Arikawa but Sakamoto is better than his record indicates and could well give Arikawa a tougher than expected test over the course of 8 rounds. Aside from the two ranked fighters there really isn't too much of note on this card which is dubbed "Untouchable Fight 21"
After last week it would be easy to say that this coming week would be a disappointment, of course it's going to be last week was genuinely special. Despite that we do have plenty of fights this coming week and the action kicks off on Monday in Japan. The action for the new week begins in the Korakuen Hall with the next Dangan show, Dangan 97. 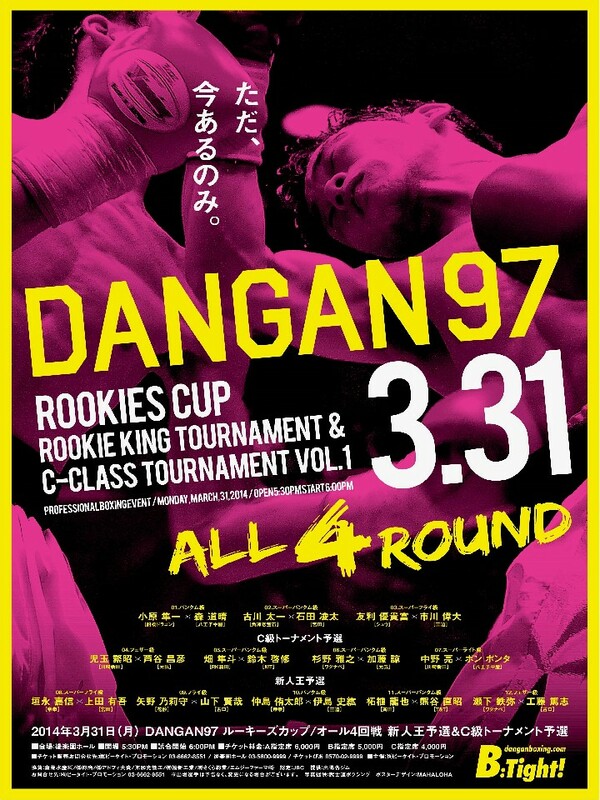 The show, which like a number of Dangan shows, doesn't focus on a particular fighter but rather the fights and in this case we get to kick the C Class tournament and Rookies King Tournament with "Dangan 97". In total the show is expected to feature an impressive 12 contests, all scheduled for 4 rounds each giving a potential 48 rounds of fights. Whilst we're unsure of all the men on the card we're going to be keeping an out for the debuting Ryota Ishida (0-0) who we believe has just turned 18. Other than the Dangan card we don't think there are any other fights on Monday. Although we tend to get a fair bit of action on Sundays it seems that this Sunday has more than usual with 4 separate cards of note for us to take a look at spread across various and with bouts of varying significance. The most show of the day is in Russia with 2 bouts of genuine note and significance even if they aren't likely to lead us directly to a new world title holder or anything like that. The biggest of those two bouts will feature the fast rising Fedor Chudinov (9-0, 7) who will be hoping to move to double figures when he fights the vastly experienced Stjepan Bozic (28-7, 19). Dimitri Sartison, who won a world title when he beat Bozic. Chudinov should be expected to win but this is a great test for someone so early in their career. The other bout of note features another unbeaten man in the form of 21 year Arif Magomedov (9-0, 6) who will also be looking to score his 10th win. Magomedov will be facing his biggest test so far as he goes into battle with Slavisa Simeunovic (12-6, 10) who has a big punch though lacks the durability to match it. Although Magomedov is relatively untested it's hard to see him even coming close to feat here. This card has several other bouts but these are easily the stand out contests. Whilst the best bouts seem to be in Russian it appears that the most notable female bout of the day is in South Korea where we get an excellent match up between Korea's very own Ji-Hye Woo (13-2, 1) and American-Korean Jennifer Han (10-2-1, 1). This bout, for the IFBA World Super Featherweight title, may not be for a major belt but it should be genuinely great and features two fighters who match up extremely well on paper. We're unaware of the details for the rest of this card though imagine that their will be more than just the single contest. One of two Japanese shows is in Hyogo. This show is headlined by OPBF and Japanese ranked fighter Toshimasa Ouchi (16-7-3, 4) who will be fighting against little known compatriot Atsushi Aburada (7-6, 4) in what appears to be a genuine mismatch. Although Ouchi isn't a world beater he is much better than his record indicates and was unfortunate not to get wins in a number of bouts, including those against Masayuki Kuroda, Kenichi Horikawa and Shin Ono, all good fighters in their own right. With that in mind it'd very hard to see Aburada getting anywhere close to a victory here. As well as the main even this card features 6 other contests, though all of them are at a very low level. The other Japanese show is in Okinawa at the Navel Cadena This card, promoted by Ryukyu Promotions appears to have a better main event than the other Japanese show as the OPBF ranked Masatoshi Kotani (13-2, 10) puts his ranking on the line against unbeaten Indonesian Rengga Rengga (7-0, 1). Rengga will be fighting easily his biggest test so far though will know that a win will put him on the map so to speak. For Kotani a loss would be a huge hit to his career even though Rengga is unbeaten. The other bout of note on this card will see Japanese based Filipino Dado Cabintoy (12-4-2, 6) fighting against the tough but limited Indonesian journeyman Rian Apriles Djabar (3-4-1, 3). Djabar has lost 4 of his last 5, according to boxrec, including losses to Petch Sor Chitpattana, Rasmanudin and the brilliantly named Erick Deztroyer. Unfortunately we doubt the completeness of his boxrec record because this will be his first fight in well over a year. As well as the two bouts we've mentioned this card is expected to feature a further 6 contests, though again they are at a low level.